With new materials and technologies, Improved Kam Chung magnesium oxide board has better performance and avoids the defects of traditional mgo board. We use an alkali-resisting glass fiber net to increase product strength, and new technologies to prevent the “crying” phenomenon. In that case, our products can be used in humid area and no need to worry about quality problem. 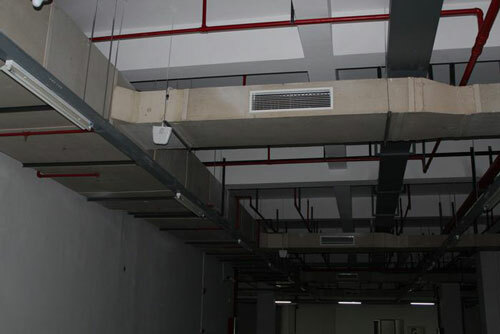 Kam Chung magnesia board is light in weight, resistant to fire, high in strength, good against moisture, thus suitable for a wide range of general building uses, such as ceiling, wall board and flooring for residential complex, hospital, school, workshop, warehouse, stadium or even furniture and billboard. (1).Draw lines on walls and paint anti-rust paint on channels. (2).Make channels on walls and fasten steel channels by following procedures. A. Make a 2cm deep channel at horizontal line of walls and get rid of the putty until you see the steels inside. B. Clean up putty and dust, and weld keels directly to the steels inside walls so as to make the whole floor system strong. C. The width of channels should be same as that of channel steels. Sink the channel steels into the channels and fasten them by screws and then weld them together. The whole system would be integrated with walls by that. D. It is better to apply more screws to fasten channel steels with wall steels. Because that we use both size 12 I-beams and channel steels, we need to cut both ends of I-beams so as to fix them into channel steels and weld them together. Distance between each I-channel is about 60cm. (4). Weld angle steels and sub channels and paint the whole system with waterproof paint. Distance between sub channels is 60cm. (5). Welding slags must be cleaned up and welding joints be polished before installation of mgo boards. Boards should be vertically parallel to main beam. Any edge of boards must not be suspended and distance between boards can be 3-5mm. joint points of boards must be on the center of beams. (6). Length of self-tapping nails can be 55-60mm (subject to thickness of boards and beams). First drill holes and then nail them in. Hole size must be bigger than that of nail head, and nail head must be sunk into a board. Nailing sequence is from center to sides. Distance between board edges and nails close to edges is about 20mm. Distance between nails around board center is about 600mm, and that between nails near board edges is about 300mm. Nailing should be done when the general layout is finished. (7). During installation, operator should leave 3-5mm gap between boards and walls (less distance for wooden floor). gaps can be covered by silicone sealant or elastic putty.